The longtime congressman, 84, says this will be his last campaign. NEW YORK – U.S. Rep. Charles Rangel, the face of Harlem politics for generations, held off a strong Democratic primary challenge and moved one step closer to what he says will be his 23rd and final term in the House. With 100 percent of the vote counted in unofficial results, Rangel led Espaillat 47.4 percent to 43.6 percent, a difference of fewer than 2,000 votes. About 47,000 votes were counted Tuesday. The Associated Press called Rangel the winner based on fresh information Wednesday afternoon from the city Board of Elections on ballots cast that were not included in the election night tally. The number of absentee and provisional ballots were not sufficient for Espaillat to make up the difference. Rangel’s campaign had announced earlier Wednesday that he planned to attend a “unity rally” Saturday at the Rev. Al Sharpton’s National Action Network headquarters in Harlem. “Now that the campaign is over and Congressman Rangel has won, we look forward to coming together and addressing the issues facing the 13th Congressional District,” senior campaign adviser Charlie King said in a statement announcing the appearance. Espaillat’s campaign declined to comment. Late Tuesday night, Rangel dubbed himself the nominee in an unprecedented, nearly hour-long folksy speech that was part thank you, part real-time political analysis and, eventually, part declaration of victory even though the race was at that point too close to call. At one moment during his rambling address, the stage buckled under the weight of the 22-term congressman and more than a dozen elected officials who wanted to stand near him. After determining that no one was hurt, Rangel resumed talking. And talking. Acknowledging that he was “killing time” as the votes were being counted, Rangel held court, continually introducing new speakers and asking his advisers and journalists for updates on the latest totals. Finally, after a local TV station called the race, balloons dropped from the ceiling. Rangel raised his arms aloft and smiled. Espaillat was bidding to become the first Dominican-American in Congress. He has not conceded, urging that every vote be counted, and his team has said it could mount a legal challenge. 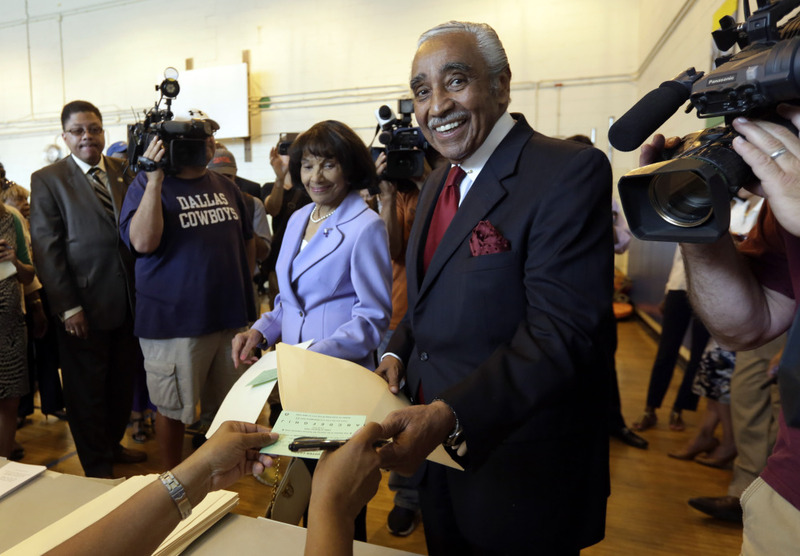 The race was a rematch of their 2012 primary, narrowly won by Rangel. Rangel, known as the Lion of Harlem, was once arguably the most influential black elected official in the U.S., known for his gravelly voice, impeccable suits and staunch liberal views, including his outspoken opposition to apartheid and the Iraq War. But he was weakened after 2010 ethics violations that forced him to give up the chairmanship of the powerful House Ways and Means Committee, and his district was then redrawn to include parts of the Bronx, which along with accelerating gentrification of Harlem transformed a heavily black district into one that was majority Hispanic. Harlem Pastor Michael Walrond and Bronx activist Yolanda Garcia also ran, finishing far back.